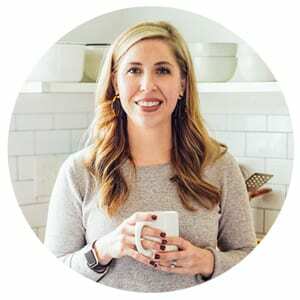 A Note From Kristin: When we first started Live Simply our intent was to strictly share real food recipes and homemade products. 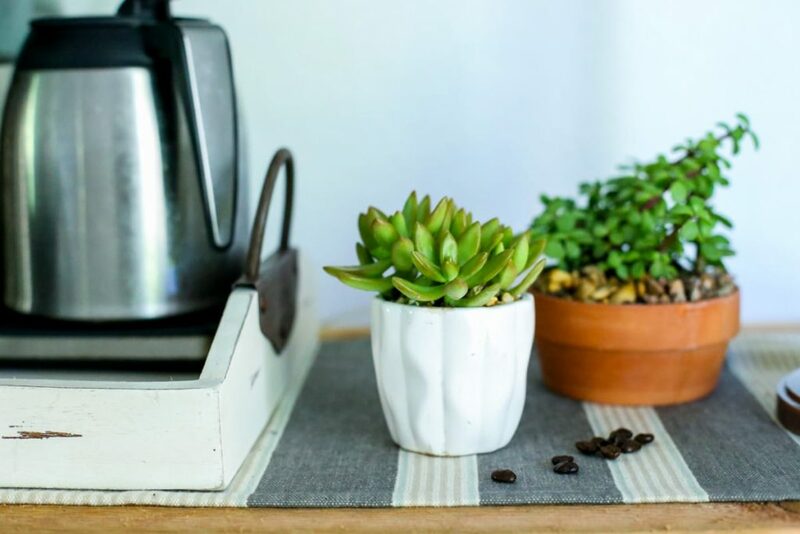 Products I was inspired to share based on our journey to simplify our natural lifestyle. 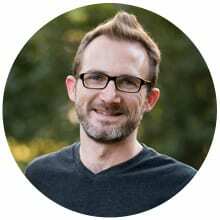 Over the past two and half years Live Simply has remained pretty much a food and DIY natural product related blog, but our life also extends beyond this realm. Early this year, Dustin started making a few furniture pieces for our home, starting with a headboard from old wood planks. I just had to share his handiwork on Instagram. 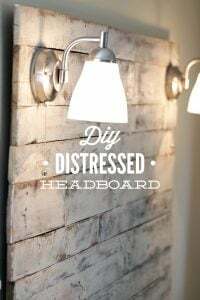 The response from Instagram readers immediately started pouring in, “I need that!” We decided to post the tutorial on the blog. 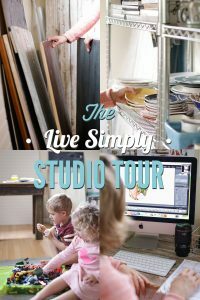 Since then, many of you have expressed interest in Dustin’s projects, so from time to time we’ve decided to include them here on Live Simply. After all, life is about more than just burrito bowls and homemade laundry soap, sometimes. 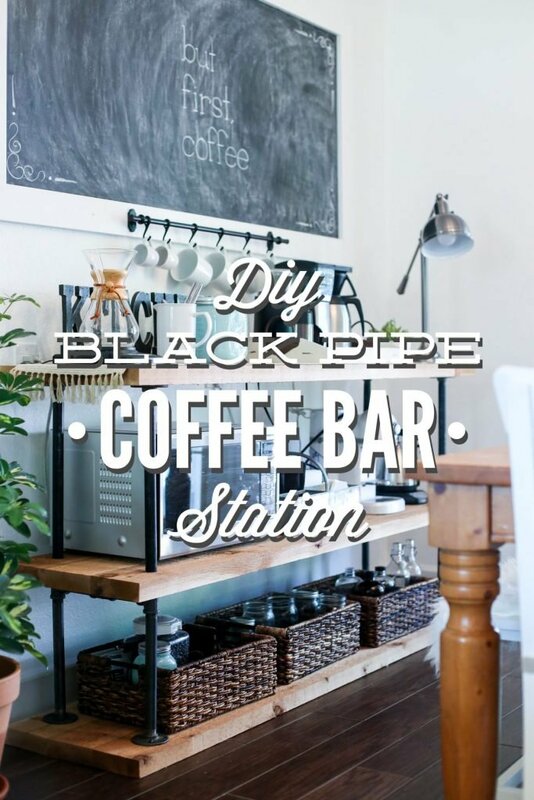 This edition of “Dustin Made Something Amazing” features a tutorial for a DIY Black Pipe Coffee Bar Station. 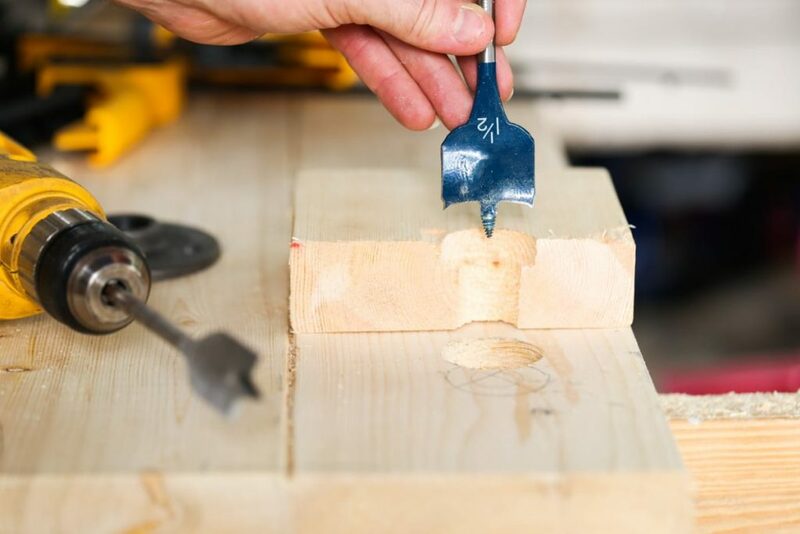 To guide you through this project I asked Dustin to share a complete step-by-step tutorial. Hey, it’s Dustin here! I’m excited to share another DIY tutorial with you. We love coffee! In-fact, my brother owns a coffee company that supplies local businesses with freshly roasted quality beans and equipment. Coffee-making can be a very comprehensive and scientific art. It’s far from the days of Folgers in my parent’s home. You must invest time and energy into brewing the best cup of coffee possible. We have a higher end coffee maker by Bonvtia. This makes several cups at a time and is perfect for guests and parties. 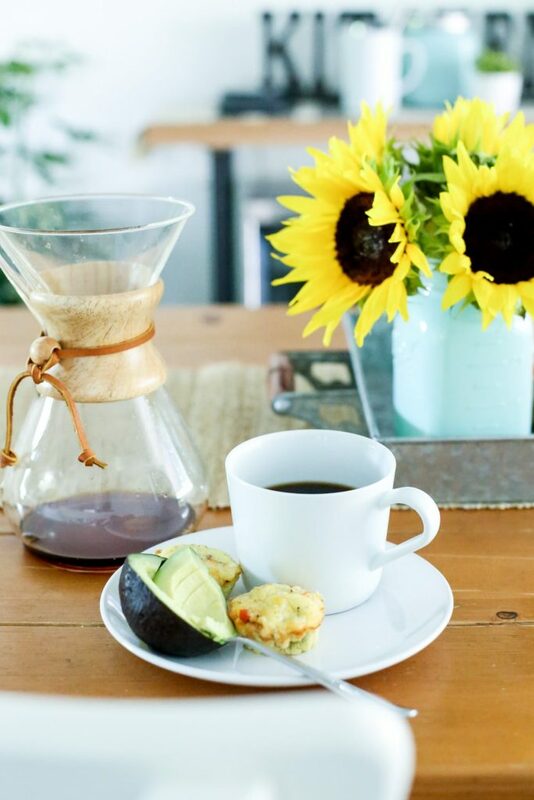 For smaller quantities and a more “perfect” brew, we have our Chemex (ideal for 2-3 cups). For more fancy tastes we have a KitchenAid Nespresso maker for special occasions. Finally, no true coffee snob would be without a burr grinder for fresh ground coffee every morning. With all our coffee-making tools, we really needed a beautiful coffee station to make our morning magic. 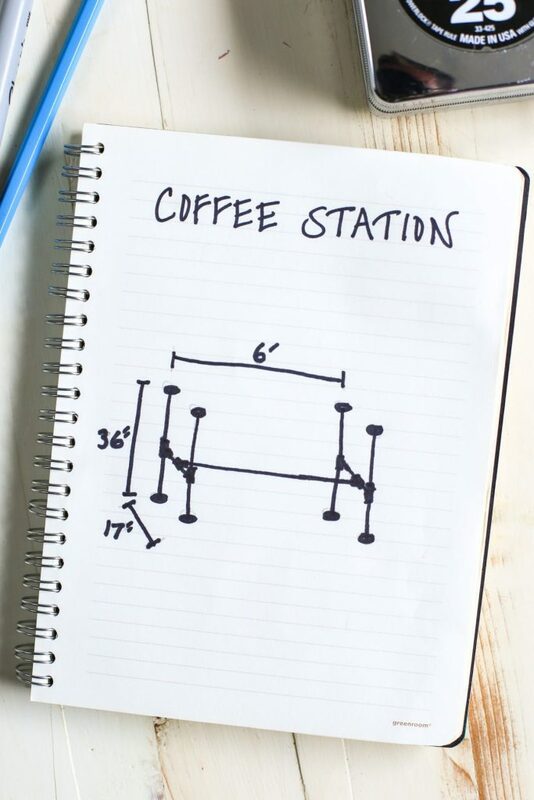 First, measure the size you’ll need for your coffee station based on the size of your area. 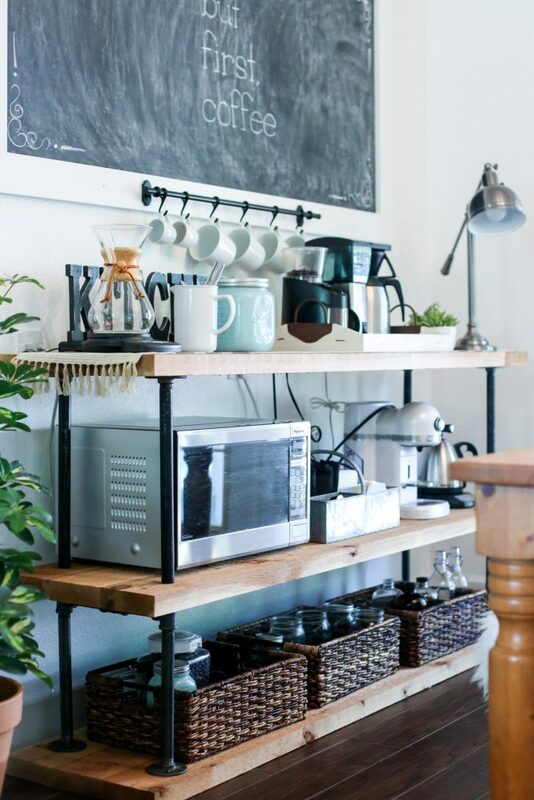 You can make the coffee station any width or height you desire. I decided to make our coffee station the same height as a normal kitchen countertop (36 inches). The width we needed in order to fit the station in our dinning room area was 6 feet. We chose a depth of 17 inches, which is the width of three 2×6 boards (I used pine boards in the photos but ended up using cyprus for the final product. Yea, I had to make it twice). We didn’t want it too deep to interfere with walking room around the dinning room table. After a lot of planning of the design and construction, I came up with a cost effective and durable framework for the black pipe layout. 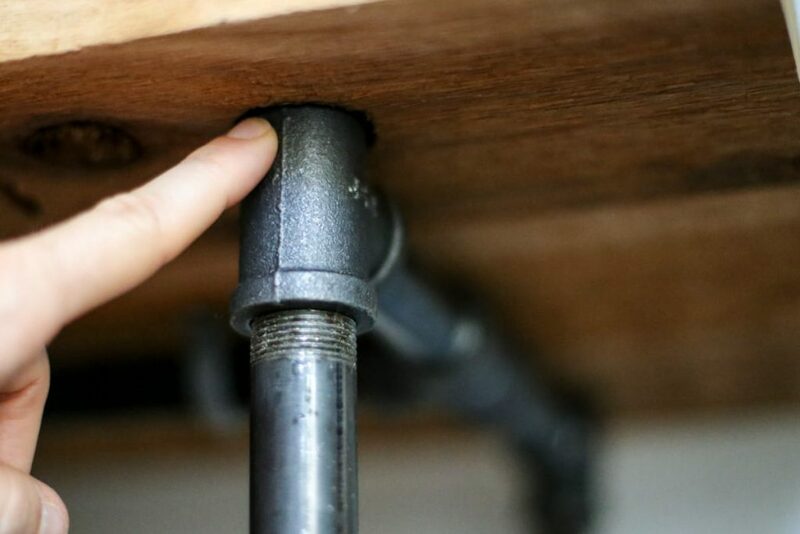 It includes 3/4 inch pipe, and flanges to secure to the top and bottom wood shelves and a center brace to secure swaying. 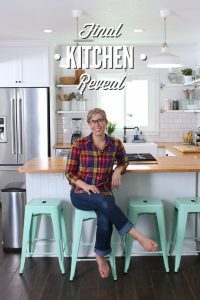 When planning our recent kitchen remodel, we didn’t want a microwave hanging above the range or have it stored in a cabinet (yes, we still own one–we’re working on that phase of natural living). We wanted to move it out of the kitchen and have it sit on the middle shelf of the new coffee station. Perfect! Black pipes don’t come in every size unless they are custom made. 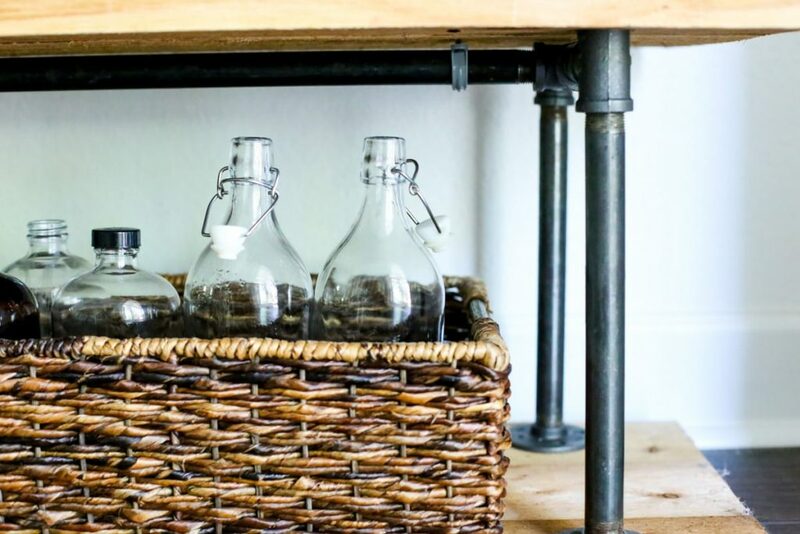 We choose a 12″ pipe for the bottom shelf and and 18″ pipe for the middle shelf to fit the microwave. 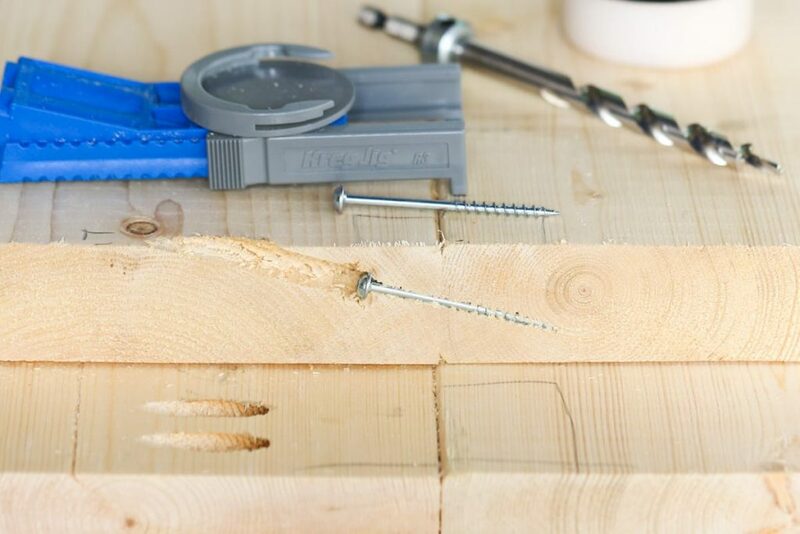 I found this life-saving tool, Kreg Jig System, to secure the 2×6 boards together. I was going to try dowels or wood biscuits but this came in so much handier and easier. 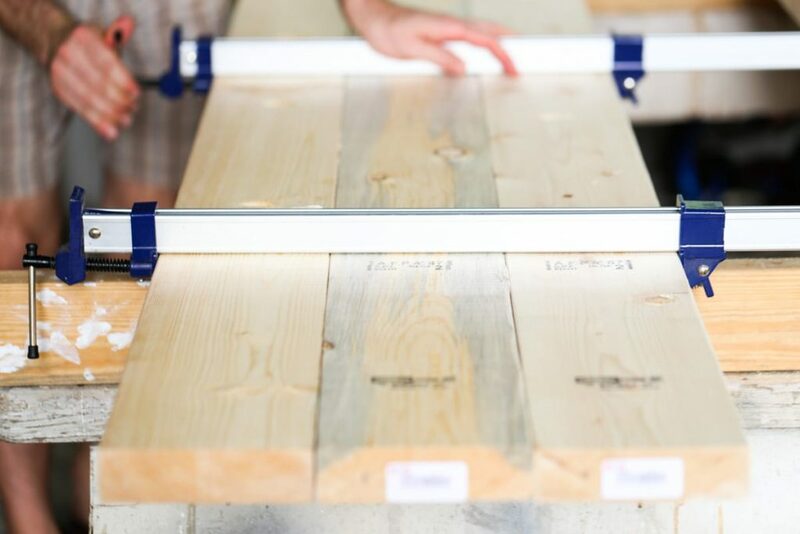 First, set up the jig system to the width of the wood per the user manual. 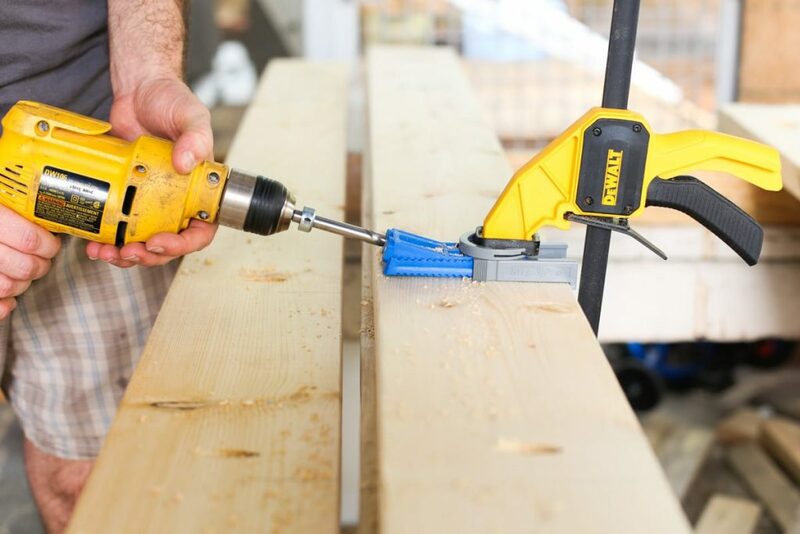 Clamp down and drill out the holes 1 foot apart. Next, glue the sides and clamp together. Then, place screws in each hole and secure. I let the clamps hold for at least 2 hours until moving to the next shelf assembly. This is a cross section I made to show you where the hole gets drilled out and where the screw is placed. I highly recommend the Kreg Jig System when joining boards together. Start assembling the pipes with the long middle brace and work out to the side legs, but stop with the straight tee’s and bottom legs. Use the top side of the straight tees for a template to mark out where the holes need to be for the middle shelf. I wanted to maintain one continuous pipe framework for durability, so I decided to run the pipe threw the middle shelf. I had to bore a hole out of the wood for the pipe to slide threw. I took it a step further to add a larger opening for the shelf to fit over the straight tee. 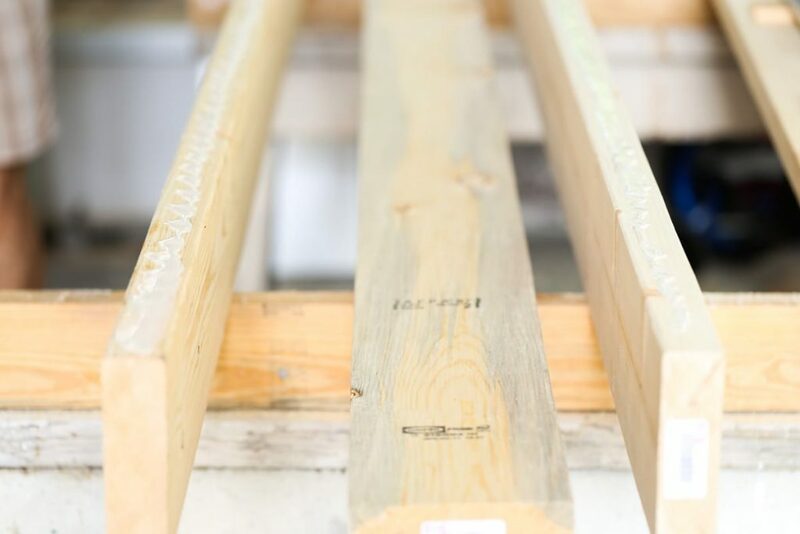 The center hole for the pipe needed to be 1 1/8″ and the size of the straight tee’s lip is 1 1/2″. Next, cut to order. We started with 8 foot boards and had to cut about 1 foot off each side to get our 6 foot desired length. This gave a 5 inch over-hang from the pipe legs. Choose a paint or stain that you desire. We stained the pine boards I made but didn’t end up liking them. We wanted something more rustic and natural-looking so we rebuilt the station in cyprus wood. We love it! 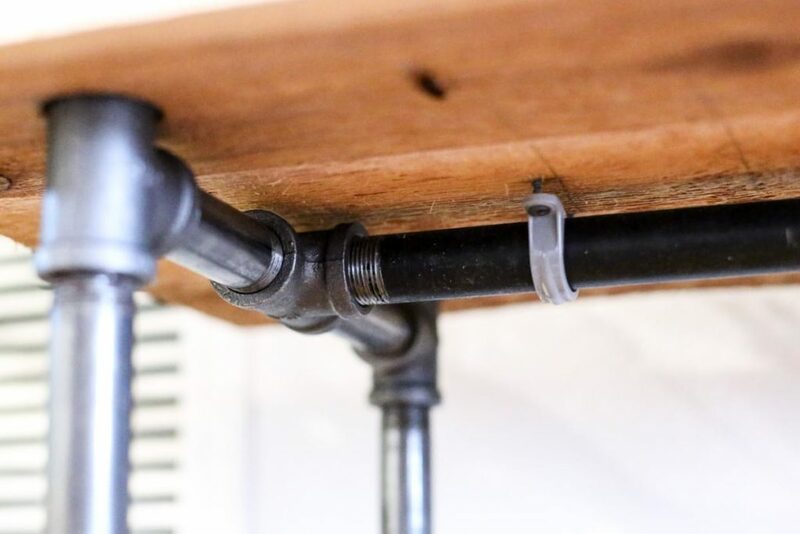 You can finish assembling the pipes by securing the bottom flanges with wood screws (make sure they are not longer than the wood boards; you don’t want them poking through the shelves), slide the middle shelf over the straight tees, slide the upper pipes threw the middle shelf and screw onto the straight tees. 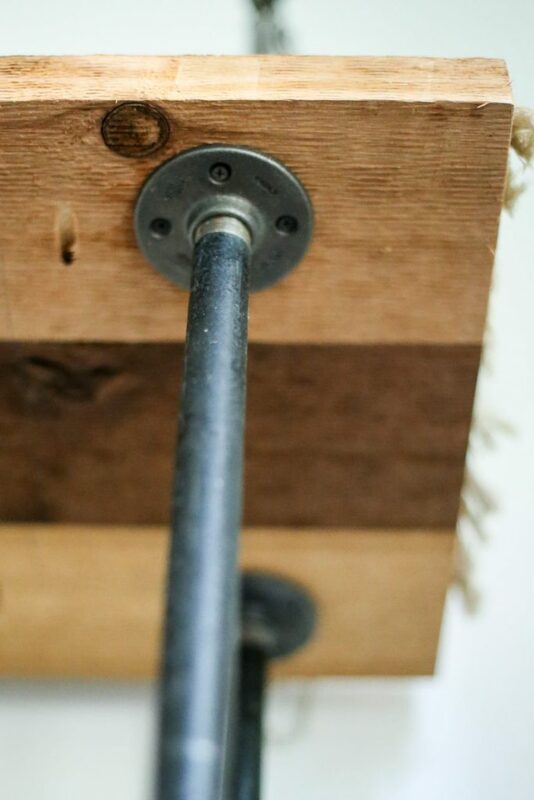 Secure the top shelf to the final flanges with wood screws. 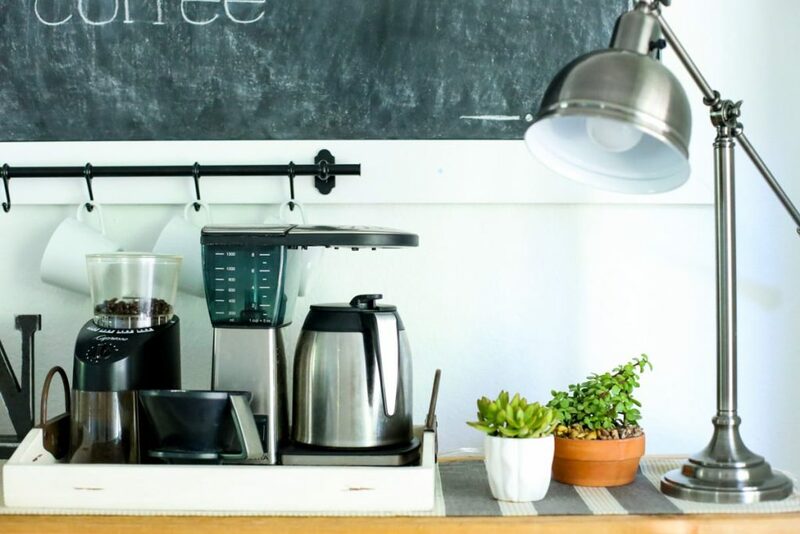 Leveling the top shelf is important; you don’t want things rolling off your coffee station. The pipes may be off-level due to many factors. Mine was slightly off in the left front corner. The pipes and flanges have about 3/8″ play to move up or down to level out the shelf. Sit back and enjoy the brew and view. Took the pressure off of me to get rid of mine, and use my cellphone less instead. ? Thank you so much, Brandi! I can’t wait to read that article. Thank you for sharing! What a great idea! Love the industrial feel. 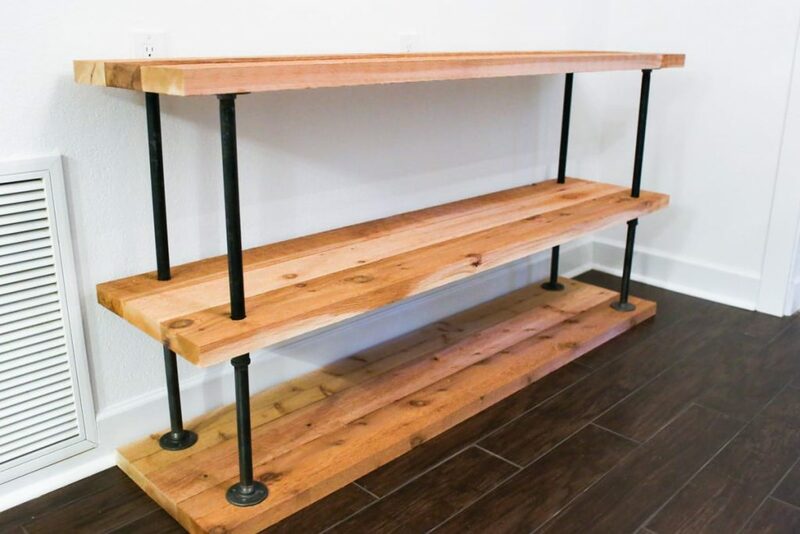 I’m going to show my husband to see if he can build a two-tiered version to use as a bench in our entryway. I also love the Chemex… we just purchased one about a month ago. The coffee tastes so good and I was so glad to ditch the plastic coffee maker! Thanks Katie, I would love to see a photo when you have the bench done. Chemex is the best! How much did the project cost you when all was said and done? Hi Tessae, The black pipe was $110 + shipping, Cedar wood was $120 and I also needed the screws and jig system. I had all the other tools and supplies. So for me it was about $275 when said and done. How cool! I am just venturing into the world of Chemex and LOVE it! I have one that I use every day for just myself, hubby doesn’t drink coffee. Right now I am using a hand burr grinder…thinking I will have to get the electric one you have 🙂 I’m curious about what you have underneath your Chemex, is it a warmer? I have a hard time keeping my warm if I don’t gulp down my coffee, that’s the only bummer about it. Also, I haven’t been weighing my beans, but after reading your notes on the coffee creamer site, I’m sure that will result in an even better cup. 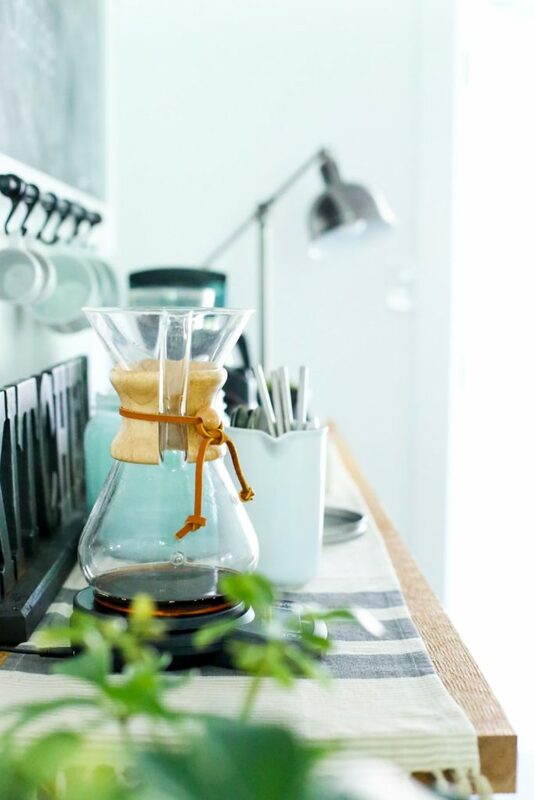 Do you have a resource on how to make the best coffee with a Chemex that you can share? Thank you for your site!!! Hey Erin, Dustin is the coffee specialist in our home, so I asked him to stop by and share his “secrets” 😉 with you later today! Awesome thank you so much!!! I do have the Bonavita kettle, need to bump it up a few degrees now though. I will definitely check out the app and the video. Thanks again for all the wonderful information! I’m so glad the info was helpful, Erin. I apologize for the super delayed response :). Wow, I love this! Want to make it now.. I would love to see your coffee bar, Linda! Have fun! I love your coffee bar. Did you paint your pipes? I have found that different sizes have different sheens to them. Yours all seem to look uniform. Thank you for sharing! Hi Susan, No we didn’t. You are right I have also noticed that different sizes do have different sheen’s. Ours are slightly different but not noticeable with the shadows and light difference. I love this! My husband and I are planning on building something very similar here soon. Did you guys end up staining the cedar wood or leaving as is? Thanks. Thank you, Cristie! We just left the wood raw–as is :). Hi this is awesome! I want to give it a go, but I don’t need it to be 5 feet. What adjustments would I need to make to have it 4feet? Also what size screws were used to attach the flanges? Oh and that was a pocket jig? Thanks!! Hey Angela, My hubby will be able to answer shortly :). Used this tutorial to outline our open shelving! I can’t figure out how to share a picture, but thanks!! That’s awesome, Beth! If you have an Instagram profile you could take a photo and share it over there and then tag me (@livesimplymom) and use the hashtag #livesimplyblog. Where did you get the pipe with the hooks for the cups? We are having a hard timing finding anything like it. Hey Casey, I’ll have Dustin respond soon. He’ll be able to answer. I would be interested in knowing where the pipe with hooks for the cups came as well. We followed this tutorial and we love it! It’s so functional, saves so much space, and is so pretty! We get compliments on this ALL the time. 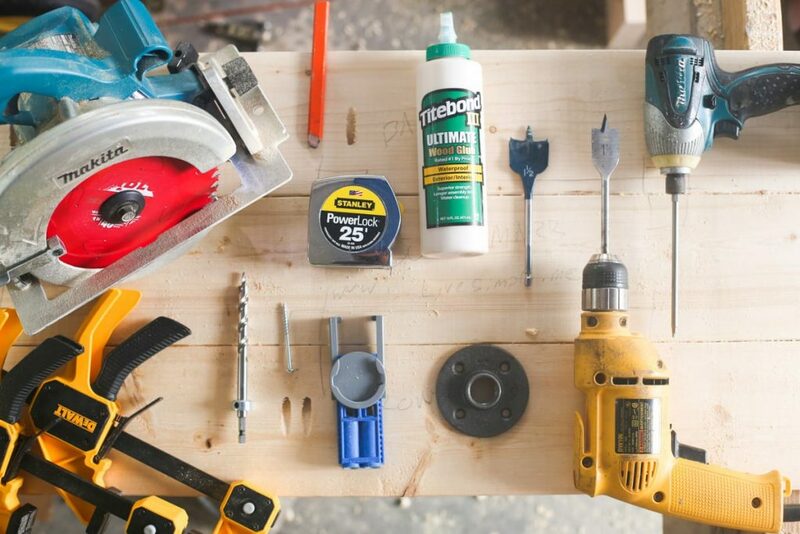 I’m hoping you can answer it for me since you seem to be pretty knowledgeable about DIY. I would be keen on knowing where the pipe with snares for the containers came also. Hi… my wife has been wanting a coffee bar for some time, and after looking at tons of DIY plans I decided to use yours! It seems very simple, however I decided to modify it just a little bit. I want a mini-fridge, so the middle section will have roughly half of a shelf while the mini-fridge takes up the other half. I also plan to put sliding rail doors on the front. I will be starting as soon as I get home from offshore, and I hope it comes out as intended. I will definitely share pics when it is complete! Thank you for sharing your ideas! That’s awesome, Chris! I can’t wait to see your design. Love this so much. The links that you used for the pipes are not working link anymore. Do you have any suggestions on where to buy those supplies at a low cost? Kristin is on vacation with her family, she will respond once she returns! Were you able to find the links for the pipes again? I’d love to be able to make this coffee station.